ICMA has undertaken a capabilities mapping initiative for participants in European fixed income markets to better understand the unique selling points of various electronic trading platforms (ETPs) and information networks. 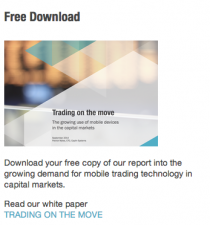 By offering a centralised one-stop shop to research the e-trading skills available in the market, ICMA members will be able to compare and contrast the various ETP providers in order to determine which platforms best suit their investment and/or trading strategies. 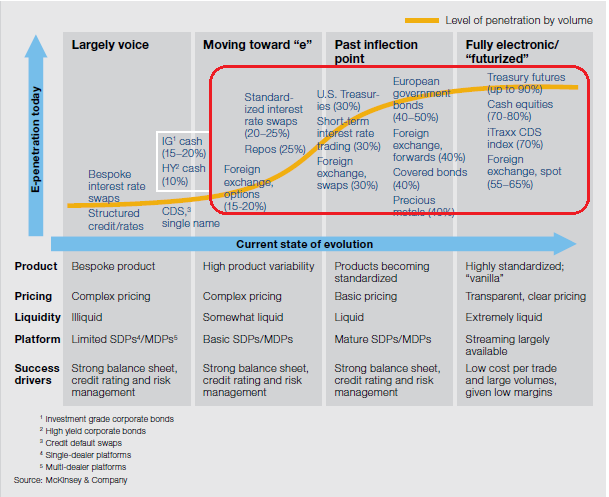 Mckinsey have a great chart that shows the evolution of electronic trading, showing the products that are ‘e-traded’, and the success drivers. Looking at the products in the red rectangle, we see the more liquid and standardised products are suitable for electrification. 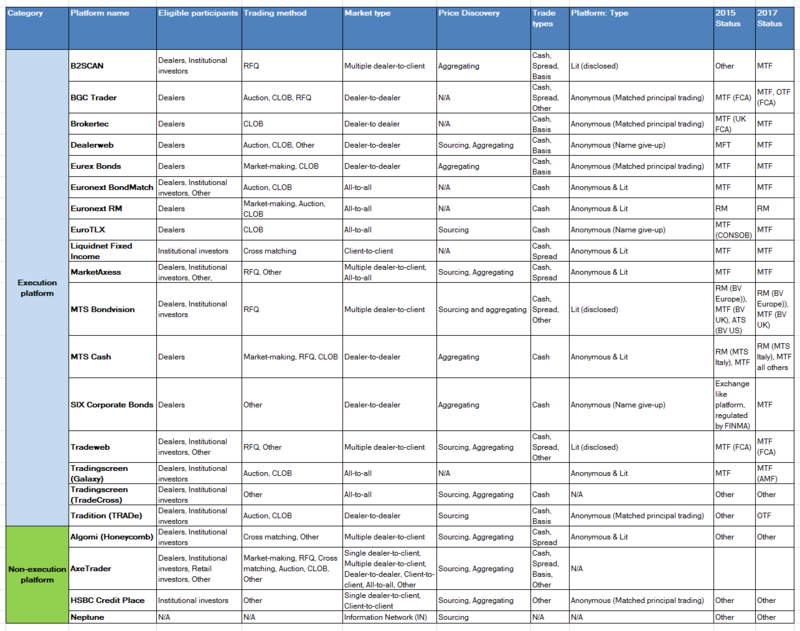 The table below, which is based on new research from Celent into European Fixed Income Market Sizing called Electronic Strikes Back, shows that in the dealer to client (D2C) segment for fixed income execution, multi-dealer platforms (MDPs) are by far the major electronic channel both in rates and credit products followed by retail platforms, with only limited flows going through single-dealer platforms. 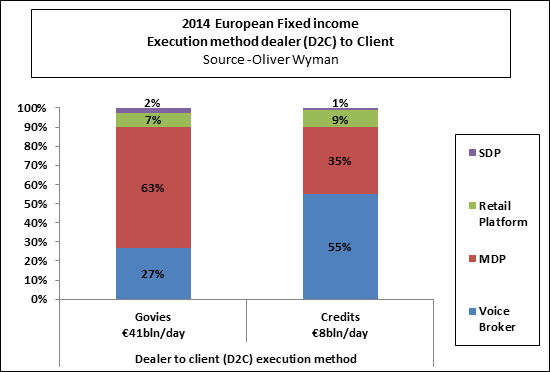 The above chart on execution methods in fixed income, is of course in sharp contrast to FX, where execution through SDPs and MDPs are almost equal. 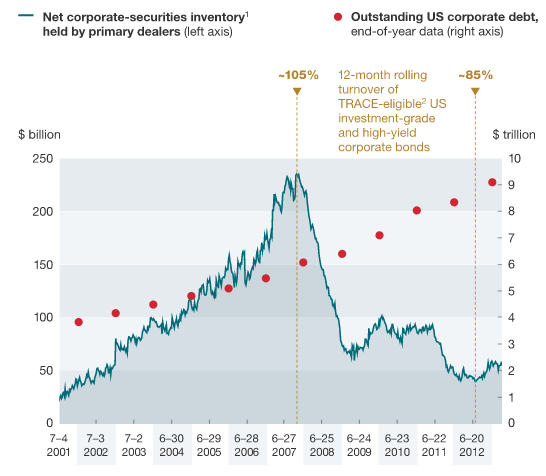 However, in fixed income, with banks pulling back in terms of liquidity provision, access to liquidity remains the biggest challenge for investors, and according to a report by Fixed income Leaders, bench-marking research by Fixed Income Leaders, some 73% of investors cited sourcing liquidity as their biggest challenge, with some 48% of investors looking to try to resolve this in less liquid products by undertaking buy-side to buy-side trading using some of the new liquidity discovery platforms being launched (such as Algomi, and others). Although given the number of new initiatives, not all will survive, as evidenced in July when BondCube closed after just three months. 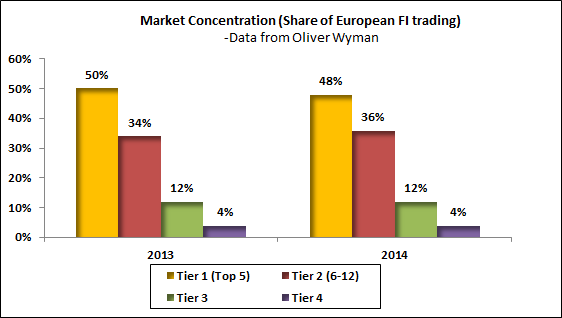 In terms of market share concentration, it seems just like in FX the top-tier banks still dominate Fixed Income, and according to Celent analysis the top five banks have 50% share in European fixed income trading. However, just like in FX the top banks are beginning to lose market share to regional Tier 2 & 3 banks. In 2014 the top five banks have lost 4% market share, whilst banks #6-12 have actually increased market share by 6%. This is partly due to some top-tier banks pulling back from some markets and partly due regional banks investing in new technology and stepping up to provide liquidity to clients.